The idea was to kill any running IE instances before entering the main portion of the test case - and just for reference, I wanted to record the URL that each closed IE window had been viewing. Turns out this is a common question for C# projects - and there seem to be some overly convoluted solutions floating around. However, one solution is quite easy - the key point is that the friendly name of the SHDocVw type library is "Microsoft Internet Controls". 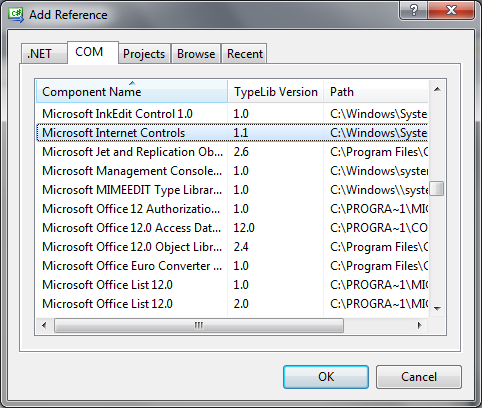 So, if you add a reference to the "Microsoft Internet Controls" COM component in your C# project, you'll be able to use SHDocVw.ShellWindows and SHDocVw.IWebBrowser2. Full disclosure - I also wrote a stackoverflow answer about this topic.